HummZinger Fancy Red Tray Hummingbird Feeder. Easy cleaning and filling. 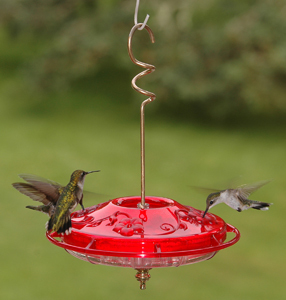 HummZinger Fancy Red Tray Hummingbird Feeder. Concerned about hard-to-clean nectar feeders? Take a look at the Aspects' HummZinger line! The bright red cover attracts hummers from a distance and removes easily so the bowl can be cleaned quickly and thoroughly. Polycarbonate construction enables a Lifetime Guarantee. An integrated wrap-around perch encourages the birds to sit and stay awhile. Built-in ant moat. Easy cleaning and filling. Hang or post mount. Raised flowers divert rain. Drip and leak proof. 12 oz. capacity.